The Red River drains a large area of over 48,000 square miles (of which 38,000 are in the United States), and follows a very meandering course in flowing northward. The water flows with a slow current through a channel that varies from 200 to 500 feet in width, and has an average depth at the banks-full stage of from 10 to 30 feet. At Winnipeg the river channel is about 330 feet in width, and approximately 30 feet in depth at the banks-full stage. In summer there is about a 10 foot depth of water in the channel. Since the earliest recorded time, weather conditions have been such that flood waters have inundated significant portions of the upper Red River Valley south of Winnipeg about once every ten years; and prior to the twentieth century, extraordinary weather conditions produced massive flooding that inundated the site of Winnipeg on average about three times in a century. During the first half of the twentieth century there was little threat of serious flooding until the onset of the great Winnipeg Flood of 1950. More recently, since the construction of the floodway, the Winnipeg site have been threatened by severe flooding on a more frequent cycle. When the great Winnipeg Flood of 1950 struck, Winnipeg had not experienced a major inundation for almost a century, and remained virtually unprotected from rising flood waters. Historically severe flooding was caused by a pattern of abnormal weather conditions that recurred infrequently, but did so in the winter of 1949-50. At the height of the flood over 10,500 homes were inundated in Winnipeg, some in waters up to 15 feet deep in low-lying areas, as water covered almost one-tenth of the city. Over 100,000 people were forced to evacuate their homes in the greatest mass exodus in Canadian history. To ensure against a future disaster the federal Department of Resources and Development undertook an extensive hydrological study and analysis of past flood and run-off characteristics, and in its 1953 report (nine volumes) submitted preliminary plans for an extensive flood control system on the Red River. The study found the boulevard dikes to be inadequate in height to deal with an extraordinary flood, and dangerous should a dike be breached. Hence, it was recommended that the diking system be supplemented by excavating a 26-mile long ditch circling to the east of Winnipeg from St. Norbert to Lockport to augment the capacity of the natural river channel in carrying floodwaters through the city, and that a 25-mile long dike be built across the Red River Valley upstream of Winnipeg at Ste. Agathe to form a detention basin for retaining floodwaters. Such a system would greatly reduce the volume of water in the natural river channel during extraordinary flood years, and preclude the flood waters rising above the boulevard dikes within the city. The flood control proposals, however, would do nothing to relieve flooding in the upper Red River Valley, and indeed the Ste. Agathe reservoir would cause increased flooding there. Fearful of the potential cost of constructing a flood control system of unprecedented magnitude, the provincial government of Premier Douglas Campbell hesitated for several years, and then appointed a provincial Royal Commission on Flood Cost-Benefit to assess the federal proposals. The Manitoba Royal Commission Report of December 1958 recommended the construction of the proposed floodway channel from St. Norbert to Lockport, with a flow capacity of 60,000 cubic feet per second, as well as the Portage Diversion with a 25,000 cubic feet per second capacity, and a reservoir dam near Russell on the headwaters of the Assiniboine River. The Commission rejected the Ste. Agathe detention basin as it would cause much of southern Manitoba to be severely flooded in a 1950 flood-level year. However, it did recommend that a feasibility and cost study be undertaken for constructing ring dikes around the rural towns in the upper Red River Valley which would still be subject to flooding. The three recommended engineering projects would cost an estimated $72.5 million: the Floodway ($57,361,000); the Portage Diversion ($8,672,000); and the Russell Reservoir Dam ($6,450,000). However, it was believed that the provincial flood control system would protect the greater part of Winnipeg from flooding in extraordinary flood years at an estimated average annual saving of $14,099, 900 in flood damage and flood fighting costs, yielding a cost benefit ratio of 1:2.73 in construction costs versus flood costs. The extent of floodwater in southern Manitoba in 1950. The Royal Commission calculated that the boulevard dikes (26.5 feet elevation) along the Red River within Winnipeg could contain a maximum river flow of 80,000 cubic feet per second (1.5 feet freeboard); and that the dikes in conjunction with the floodway, would be able to pass a Red River flood flow of 140,000 cubic feet per second in safety—a flow far in excess of the 108,000 cubic feet per second of the 1950 Winnipeg Flood. Moreover, when augmented by the Assiniboine River works, the proposed flood control system would be able to manage a combined Red and Assiniboine river flow of 169,000 cubic feet per second, a flood level reached about once every 165 years. Nonetheless, the protection provided the city would not be absolute. The exceptional flow of the record 1826 flood (225,000 cfs), if ever repeated, would exceed the design capacity of the proposed provincial flood control system, but the costs involved in building a flood control system designed to meet an all-time record flood flow were all but prohibitive and judged not cost effective. The extent of floodwater in southern Manitoba in 1979. In designing the floodway channel, the key concerns were: to determine the side slopes that would have long term stability in the local soils; to ascertain the maximum velocity of water flow allowable to preclude erosion of the floodway banks; and to select the most economical cross-section and gradient for a floodway channel capable of carrying the desired design flood flow within the allowable velocity limit. Soil mechanics studies were undertaken in examining the slopes of natural river banks in the area, and excavating trenches to conduct field stability studies of the slopes. For most of the floodway route the soil was a highly plastic lacustrine clay underlain by glacial till, with the exception of one section of high ground at Bird’s Hill ridge, which consisted of a granular fluvio-glacial deposit. As a result of the soil stability studies, the floodway was designed to have a 6:1 side slope (horizontal to vertical), increasing in steepness to 3:1 in the 67 feet deep cut through the high ridge at Bird’s Hill, and flattening out to 9:1 near structures crossing the floodway to prevent turbulence and any constriction in water flow, with transitional sections of varying slopes in between. The Red River Floodway system was designed to handle a flood of 140,000 cubic feet per second divided between the river and the floodway, with the floodway channel having a design capacity of 60,000 cubic feet per second, and the river channel having a capacity to carry a maximum flow of 80,000 cubic feet per second safety between the boulevard dikes in Winnipeg. The basic operating principle of the Red River Floodway was one of regulated balance. The two submerged hydraulic gates in the Inlet Control Structure were to be raised during years of extraordinarily heavy flooding to a height sufficient to divert into the floodway channel any and all floodwater in excess of the capacity of the diked river channel in Winnipeg; and yet not high enough to cause a backwater effect. Any back up of floodwaters in the river above the Inlet Control Structure would raise the natural level of the floodwaters, and increase the extent of flooding and property destruction in the Red River Valley upstream of Winnipeg. After three years of planning, contracts for the excavation work were let on competitive bid to Manitoba contractors, and in October 1962 work commenced on a five-year project scheduled for completion in 1967. It would require the excavation of 100 million cubic yards of earth to form a ditch 29.4 miles long, 700 to 1,000 feet wide at ground level, and ranging in depth from 30 to 40 feet. 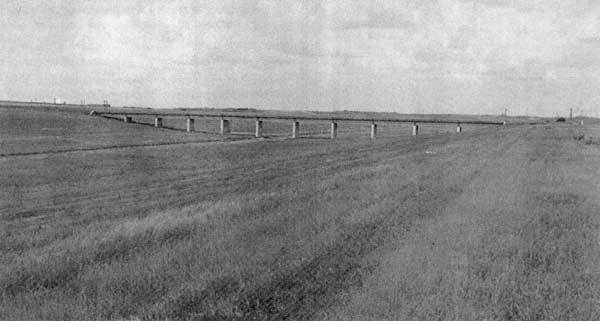 To minimize disruptions, the new bridges required (7 railway and 5 highway structures) were built in situ in advance of the full channel excavation; and natural gas and oil pipelines, water lines, six hydro-electric transmission lines, and Manitoba Telephone System lines were relocated in crossing the floodway corridor, as work proceeded in lowering two branches of the Shoal Lake Aqueduct to pass under the new floodway channel. A syphon was also constructed to carry the Seine River, a tributary of the Red River, under the floodway channel. Construction work continued almost year-round on the floodway project, with the exception of the compacting work which was suspended during the winter months. The excavation of the floodway channel proceeded in the dry with the spoil being used to build up the berms along each side. No serious water problems were encountered with the exception of rain, which made the clay extremely slippery and very hard to excavate, although sump holes and pumps were used to drain the excavation as construction proceeded. Over 50 large rubber-tired scrapers were eventually used on the project as they proved much more manoeuvrable, and less apt to get bogged down in the Manitoba gumbo, than earthmovers with tracks. Only the Inlet Structure had to be built in the river bed. The work site was dewatered through constructing coffer dams and a temporary diversion channel to carry the flow of the Red River around the worksite. The Outlet Structure was built in the dry in the Floodway Channel excavation. Map of the Red River drainage area showing the Red River Floodway, Portage Diversion, and Shellmouth Reservoir. When Grand Forks flooded, forecasts for Manitoba indicated that the floodwaters could be high enough to back up a tributary of the Red River, the Morris River, causing it to overflow the high ground at Brunkild that separated the Morris and La Salle river basins. Such an occurrence would have disastrous consequences. Floodwaters flowing overland into the La Salle River could pass around the West Dike of the floodway, and re-enter the Red River downstream of the Inlet Control Structure at the junction of the La Salle and Red rivers. In such an event, over 2,300 homes in the St. Norbert section of Winnipeg would be immediately inundated. Moreover, it was estimated that flood waters flowing overland into the La Salle River basin would add a flow of as much as 40,000 cubic feet per second to the Red River downstream of the Inlet Control Structure, and would raise the level of the river waters a further 2 to 4 feet, thereby placing downtown Winnipeg in immediate danger of inundation. As the floodwaters approached Winnipeg there were fears that the West Dike Extension might not hold, and serious concerns as to how the floodway system would cope with the stupendous flow of water. When the flood crested at Winnipeg on May 4th-6th the peak discharge (unregulated) of the Red River north of the Assiniboine River was 162,000 cubic feet per second, close to the maximum design capacity of the provincial flood control system. Moreover, the peak discharge on the Red River at the Inlet Control Structure, was 140,500 cubic feet per second—slightly in excess of the design capacity of the Red River Floodway system. Indeed, the 1997 flood exceeded the flow of the 1950 flood by 50%, and was the first inundation in 145 years to attain such a magnitude. Unregulated the waters of the “Flood of the Century” would have reached a height of 34.3 feet, about 8 feet higher than the primary dikes within the city. With the flood at its crest the flow of water diverted through the floodway reached 66,000 cubic feet per second, exceeding its 60,000 cubic feet per second design capacity; and the peak flow in the river channel, passing through the Inlet Control Structure, reached 74,500 cubic feet per second, greatly exceeding the previous regulated maximum attained in 1979. However, despite fears to the contrary, the floodway proved capable of diverting sufficient waters to enable the boulevard dikes to contain the remaining river flow, and the West Dike Extension held to prevent any bypassing of the floodway system. Downtown Winnipeg was spared from a complete and devastating inundation in the “Flood of the Century”. Within Winnipeg the Assiniboine River had a negligible effect on the volume of water in the Red River owing to the operation of the flood control structures on that tributary river system. Unregulated, the Assiniboine River had an estimated peak discharge of 25,000 cubic feet per second during the height of the Red River flood of 1997, but with the Shellmouth Reservoir retaining some floodwaters and a major diversion of water through the Portage Diversion to Lake Manitoba, the flow of the Assiniboine River at Winnipeg was reduced to as low as 1,600 cubic feet per second when the Red River was at its flood crest. Indeed, at the crest of the flood the Red River waters backed up several miles into the Assiniboine River. With the end of the flood, about May 23rd, it was evident to all that the Red River Floodway had proved its efficacy under the most extreme flood conditions imaginable. In the face of an almost unprecedented flow of water, the floodway reduced the flow of the Red River sufficiently to prevent an overtopping of the boulevard dikes within Winnipeg, and thereby saved the downtown business sector and a large area of the city from a severe inundation. Moreover, the Red River Floodway was the critical element in the provincial flood control system. Red River Floodway channel with grassed slopes. Although forced to operate the floodway beyond its design capacity during the “Flood of the Century”, provincial authorities had remained confident that, if need be, upwards of 100,000 cubic feet per second could be diverted through the floodway. It would have required, however, an emergency closure of openings in the berms where highway and railway bridges crossed the floodway, and/or emergency diking along the eastern Perimeter Highway to form a secondary dike to protect the city from the excess of diverted floodwaters. Moreover, the bridges crossing the floodway might have had to be removed, or blown up, to eliminate impediments to the flow of the excess floodwaters past the city. As it was, the waters backed up by the Inlet Control Structure in diverting a peak discharge of 66,000 cubic feet per second through the floodway channel, increased the flooding of farmlands outside of Winnipeg to the east of the floodway channel in the rural municipality of Ritchot, contributing to the flooding of over 125 homes at Grande Pointe. With the floodway in operation comparatively little damage was done by the “Flood of the Century” within Winnipeg, and there was no appreciable damage from sewer backup. The pumping stations, established since the 1950 flood, pumped drainage water and sewage through the dikes, and storm sewer outlet drains were closed off. These measures thereby prevented any river backup flooding large areas of the city where a combined storm sewer and sanitary sewer system still existed. Moreover, a massive sandbag diking operation protected most of the exposed homes outside the primary dikes. As a result only thirty homes were flooded within Winnipeg in spite of dire predictions of potential devastation on the approach of an all but unprecedented flow of floodwaters. However, had the floodway not been in place, and capable of functioning beyond its design capacity, the “Flood of the Century” at its peak would have inundated over two-thirds of Winnipeg, and have caused an estimated $4 billion in flood damages. Senator and former Premier, Duff Roblin with Inlet Control Structure in background. Tested under severe flood conditions, the Red River Floodway silenced its critics, proved the sagacity of its proponents, and established beyond dispute the viability of the concept, the efficacy of its design, and its almost inestimable worth in cost-benefit terms. The floodway proved capable of controlling floodwaters even in excess of its design flood function, and saved the federal government, the province, the municipality, and many local property owners, a total of billions of dollars in expenditures that would otherwise have been required for emergency flood abatement, flood relief, rebuilding, and clean-ups. Although the original cost-benefit for the floodway project was estimated at 1:2.73 calculated over a fifty-year period of only emergency use during years of extraordinarily high spring floods, the floodway was in operation twenty times during the 29 years prior to 1997 to divert threatening floodwaters past Winnipeg; and in but one year of almost unprecedented flooding—during the Flood of the Century in 1997—yielded a cost-benefit ratio of roughly 1:40, a phenomenal return on construction costs. As a construction project the Red River Floodway was by far the largest excavation project undertaken in Canada to that date, and remains so to this day. It was a construction project of national stature, and an impressive achievement in its scale of construction, planning, and organization. None-the-less, the demands of the project were typical of large-scale engineering construction projects; the machinery and equipment employed were conventional; and the floodway structures embodied known engineering principles, technologies, and materials of construction. Beyond a doubt, the Red River Floodway ranks as an outstanding engineering achievement, but its significance rests not so much in its scale, construction, or the physical properties of its structures, as in its design concept, function, and socioeconomic impact, as well as in its symbolic importance to Canadians. * The author would like to thank the Water Resources Branch, Manitoba Natural Resources, for comments on earlier drafts of a report prepared for the Historic Sites and Monuments Board of Canada (HSMBC Submission Report, 2000-05) on which this article is based. The argument expressed herein is solely the responsibility of the author, and does not necessarily reflect nor represent the views of either Manitoba Natural Resources or Parks Canada. 1. J. A. Griffiths, “The Red River Floodway”, Canadian Geographical Journal, February 1965, Vol. LXX, no. 2, pp. 42-43; and J. M. Bumsted, Floods of the Centuries: A History of Flood Disasters in the Red River Valley, 1776-1997, Winnipeg: Great Plains Publishers, c. 1997, pp. 8-9. 2. Winnipeg Free Press, A Red Sea Rising, The Flood of the Century (Winnipeg: Winnipeg Free Press, 1997), p. 4. 3. Bumsted, pp. 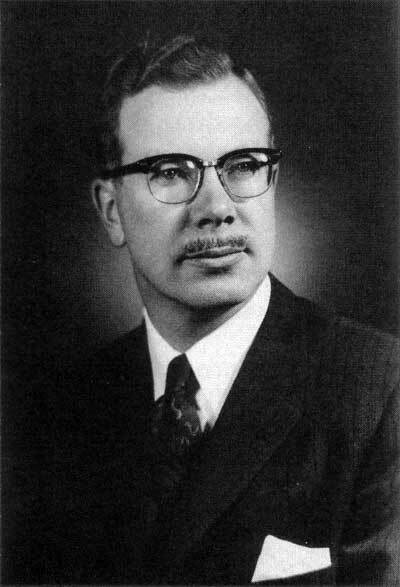 7-12; W. D. Hurst, The Red River Flood of 1950, Papers read before the Historical and Scientific Society of Manitoba, Series III, no. 9, Winnipeg, 1954, p. 59; and Gene Krenz & Jay Leitch, A River Runs North, Managing an International River (Red River Water Resources Council, 2nd. ed., 1998), pp. 3-8. Secondary factors such as rapid snowmelt, frozen soils, and unfavourable timing of tributary runoff, can aggravate flooding significantly, but are not essential for major flooding (Water Resources Branch, Manitoba Conservation). 4. Bumsted, p. 8; Griffiths, p. 43; and Hurst, p. 59. 6. Bumsted, pp. 9-20; W. F. Rannie, “The Red River Flood Control System and Recent Flood Events”, Water Resources Bulletin (American Water Resources Association), Vol. 16, no. 2, April 1980, p. 207; James A. Jackson, The Centennial History of Manitoba (Toronto: McClelland & Stewart, 1970), pp. 64-65; and Website: http//www.gov.mb.ca, Manitoba Natural Resources, Water Resources, “Facts and Figures about the Flood of the Century”. The flood heights cited at Winnipeg are the height above normal winter ice as recorded at the James Avenue Pumping Station. (The provincial government records flood levels in feet above sea level. For example, the 36.5 feet height (city datum) of the 1826 flood is recorded as 764.07 feet geodetic.) As figures vary in published sources as to the height of the 1826 flood, the figure given herein is from “Facts and Figures”, but expressed in city datum as are all other flood levels (flood stages) in keeping with the more widely used system. This is likewise the case with flood heights and flow rates cited for other flood years. Imperial measurements are used by North American hydrologists in measuring flood stages on the Red River as the metric equivalents are less useful in scale, and do not yield readily meaningful data for comparisons of flood levels and flows in the historical record. 7. Bumsted, pp. 20-49; and A. A. Den Otter, “Irrigation and Flood Control” in Building Canada: A History of Public Works (Toronto: University of Toronto Press), p. 158. 8. Hurst, pp. 63-78; Den Otter, p. 158 & 162; Weber, p. 759; and Rhonda Bruchanski, “City Prepared for Worst-Case Flood Situation”, The Metro (Winnipeg), 25 March 1997. 9. Hurst, pp. 78-79; and Thomas E. Weber, “The Red River Floodway and Related Flood Control Works”, International Conference on Water for Peace, Planning, and Developing Water Programs, Vol. 7, Washington: U.S. Government Printing Office, 1967, p. 759. The lake formed by the flood waters held an estimated 190 billion gallons, or 700,000 acre-feet of water (Ibid, p. 39). There was only a small flow in the Assiniboine River at the height of the Red River flood in 1950 (Hurst, p. 59). 10. Bumsted, pp. 71-75. The Saguenay River Flood at Chicoutimi, Quebec, in July 1996, killed seven people, forced the evacuation of 12,000 from their homes, and caused $700 million in flood damages (1996 dollars). The federal government paid 90% of the costs under federal flood-assistance programs. 12. Bruchanski, 25 March 1997. 14. Bumsted, pp. 85-86; Weber, p. 760. The Assiniboine River did not flood during the 1950 Winnipeg Flood; however, the Assiniboine River works were intended to provide a further protection for Greater Winnipeg against the odd year when the Red and Assiniboine river floods might peak at the same time. A study of the flood characteristics of the Assiniboine River, completed by the federal Department of Agriculture, Prairie Farm Rehabilitation Administration (PFRA), was appended to the Red River study. 15. Manitoba, Royal Commission on Flood Cost-Benefit, 1958 (Winnipeg, December 1958), pp. 1-5. The Commission also recommended that the floodway entrance be moved five miles upstream (south), at a further cost of $3 million, to bring all of St. Norbert within the protected area. This was subsequently done, increasing the length of the floodway to 29.5 miles (47 km). The total flood costs saving was calculated at $700 million over a 50-year period, without accounting for any potential increase in population or price levels; and the total construction cost was calculated on a 50-year amortization period for paying off the debt at a 4% annual interest. 16. Rannie, p. 210; Jackson, The Centennial History of Manitoba, p. 250; and A Red Sea Rising, p. 19. The quote is from Jackson, p. 250. A major concern of opponents was the potential long-term debt load represented by the capital costs amortized at the then-current loan rate of 5% interest over a 50 year period. To avoid such a heavy long term debt load, the province paid its costs out of current revenues. 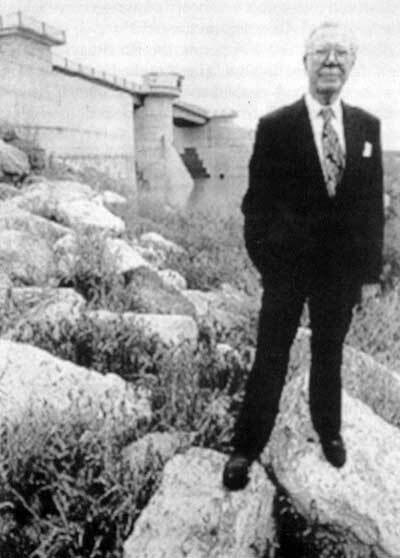 This imposed a heavy economic burden on the province during the construction of the flood control system, but avoided a massive long term debt load (Bumsted, “Roblin’s Folly becomes Duff’s Ditch”, Winnipeg Real Estate News, 9 May 1997; and “Ditch Digger, Roblin poured careful reasoning into floodway”, Sunday Free Press (Winnipeg), 20 April 1997.). 17. Griffiths, p. 46. The head of the Advisory Board was J. A. Griffiths, Director, Water Control and Conservation Branch. The other members were: T. E. Weber of the same department; W. D. Hurst, City Engineer, Winnipeg; R.H. Clark and P. W. Strilaeff, Canada, Department of Northern Affairs; and G. W. Watson, Chief Engineer, Prairie Farm Rehabilitation Administration (PFRA),Canada, Department of Agriculture. 18. Griffiths, pp. 46-47; and Weber, pp. 762-764. 19. Manitoba Natural Resources, “Plan of Provincial Waterway and Red River Floodway”, 83-06-01, File 11-5-11068A. The central section of the floodway passed through farms surveyed in quarter mile square sections, thereby minimizing the number of expropriations required; and the southern section of the floodway for the most part ran perpendicular to the Red River through the parish of St. Norbert thereby minimizing the number of property expropriations in an area where the long, narrow, river front farms of the older French land tenure system also prevailed. 20. Weber, p. 762; Griffiths, p. 47; and J. Mishtak, “Soil Mechanics Aspects of the Red River Floodway”, Canadian Geographical Journal, Vol. I, July 1964, No. 3, Pp. 133-146. Because of the design limit on the gradient of the floodway channel, the floodway at its exit is 14 feet above the level of the Red River which dropped a total of 32 feet in passing from St. Norbert through Winnipeg to Lockport, inclusive of a 10 feet drop at the St. Andrew’s Rapids north of Winnipeg. Hence, an Outlet Structure, a combined rollway and stilling basin, was designed for the floodway channel exit to dissipate the energy of the floodwaters discharging from a 14 feet height back into the Red River. 21. Ultimately all slopes were seeded with an alfalfa-based hay mix, together with a faster growing cover crop of either rye or oats that germinates more quickly to provide shade for the slower growing hay. The usual alfalfa-based hay mix was: 12% alfalfa; 16% brome; 25% meadow fescue; 25% creeping red fescue; 16% Russina wild rye; and 6% alsike clover (Alan Skrepnek, Planning and Communications Officer, Water Resources Branch, Manitoba Conservation). 22. Weber, pp. 761-764; Griffiths, pp. 47-49; and Manitoba, “The Red River Floodway (pamphlet). 23. Steve E. Gahbauer, “Distributors enjoy equipment bonanza as Canada’s ‘Big Ditch’ gets longer”, Engineering and Contract Record (Don Mills, Ontario), November 1963, Vol. 76, no. 11, pp. 49-51. At the Bird’s Hill ridge the excavation reached 67 feet in depth. The Seine River syphon has a capacity of 100 cubic feet per second, and there is a drop structure to carry any excess flow directly into the floodway. 24. E-mail, Alan Skrepnek, Manitoba Conservation, to R. W. Passfield, 10 February 2000. 26. Bumsted, Floods of the Centuries, p. 94; e-mail, A. Skrepnek, Manitoba Natural Resources, to R. W. Passfield, 6 December 1999; and Rannie, p. 210. Ste. Agathe, which was on higher ground and unaffected by the 1950 flood, did not participate in the ring dike construction. In 1966, the federal Department of Indian Affairs and Northern Development built a ring dike around the Roseau River Reserve. Later, the Province built a ring dike around Brunkild. Subsequently, in 1983-1991, the eight municipal ring dykes were strengthened and raised to the 100-year flood level under a new federal-provincial agreement signed in March 1983. See Canada/Manitoba, Manitoba Flood Protection Projects Agreement, 1990-91 Annual Report (October 1991). 27. Weber, p. 761; and Rannie, 1980 , pp. 209-210. The Portage Diversion cost $20.5 million, and the Shellmouth Dam project $10.8 million. The federal government contributed $9.3 million and $5.4 million, respectively, towards the construction costs. 29. On the Canadian section of the St. Lawrence Seaway navigation and power project (1954-1960), over 55 million cubic yards of material were excavated and a further 18 million cubic yards dredged. However, in some areas the material excavated comprised a very hard and abrasive silica sandstone (Potsdam sandstone) that almost defied removal in its unbroken form (See Eric Le Bourdais, “St. Lawrence Seaway - Part 2, Construction Aspects”, Roads and Engineering Construction (Toronto), Vol. 96, no. 11, November 1958, pp. 32-43). The St. Lawrence Seaway cost $481 million, of which Canada contributed $340 million. 32. Rannie, pp. 207 & 211-212. 33. A. A. Warkentin, The Red River at Winnipeg (Manitoba Natural Resources, September 1999), p. 17. In 1974 the peak flow on the Assiniboine River was 32,000 cubic feet per second at Portage La Prairie of which 18,000 cubic feet per second was diverted to Lake Manitoba. Without the Portage Diversion, the Assiniboine flow would have been 26,000 cubic feet per second, the second largest on record and, at that time, well in excess of the river channel’s capacity through Winnipeg. The Shellmouth Reservoir retained only 6,000 cubic feet per second as the runoff started late from the upper Assiniboine basin. On the Red River, 37,000 cubic feet per second was diverted into the Red River Floodway. Overall, the flood control works reduced the 1974 peak stage in Winnipeg by 10.0 feet. 34. Rannie, p. 211; and Manitoba Natural Resources, Waters Resources Branch, “Facts and Figures about the Flood of the Century”. In 1976, the federal and provincial governments acted to discourage further building in the flood-prone zones outside of the boulevard dikes by withdrawing mortgage guarantees and other financial assistance programs for new private development in the high-risk areas (Rannie, p. 213). 35. Gordon Sinclair Jr., “Duff’s Ditch Top Investment”, Winnipeg Free Press, 25 July 1993, p. Al. 36. Bumsted, Floods of the Centuries, p. 102. 37. Rannie, pp. 209 & 212. 38. Red Sea Rising, pp . 7-13; and A. A. Warkentin, The Red River Flood of 1997 - An Overview of the Causes, Predictions, Characteristics and Effects of the Red River Flood of 1997 (Manitoba Natural Resources, July 1997). In the United States flood levels are recorded from the riverbed. Hence, the Red River floodwaters rose 54 feet above the riverbed at Grand Forks where the permanent dikes were built to a 52-foot height above the riverbed. The downtown streets were flooded to a depth of upwards of 13 feet (Maclean’s Magazine, 5 May 1997, p. 32). 39. Red Sea Rising, pp. 27-92; Bumsted, Floods of the Centuries, pp. 106-114; and “Winnipeg Rescue Hurts Towns: Report”, Globe & Mail, 15 May 1998. The floodwaters were flowing with a current of anywhere from 25 to 30 km/hour (Red Sea Rising, p. 103). On 27-28 April 1997, the Red River flowed past Emerson at 132,00 cubic feet per second. The flow of the Red River in flood, however, did not approach the average annual mean discharge of the Mississippi River (595,000 cubic feet per second) at Vicksburg, Mississippi, or the maximum discharge ever measured in the Mississippi River (2,159,000 cubic feet per second) at Arkansas City in 1937 (John R. Hardin, “Evolution of the Mississippi Valley Flood Control Plan”, Journal of the Waterways and Harbors Division (ASCE Proceedings), Vol. 83, May 1957, p. 1251-1). 40. Bumsted, Floods of the Centuries, pp. 114-115; Red Sea Rising, pp. 55-63, and 166; and Winnipeg Free Press, 27 April, p. Al, 28 April, p. Al, April 29th, p. Al, and 1 May 1997, pp. Al-A2. The southern perimeter highway formed a second line of diking, and would have protected the rest of Winnipeg north of St. Norbert from immediate overland inundation should the West Dike Extension have failed. However, at the peak of the flood it was highly unlikely that sufficient additional waters could have been diverted through the over-extended floodway to fully compensate for the additional inflow of waters into the Red River within Winnipeg from any breaching of the West Dike Extension. Hence, there was a real danger that a failure of the West Dyke Extension would have resulted in the Red River overtopping the primary dikes and flooding a large area of Winnipeg. More recently, the West Dike Extension (the so-called Z-Dike) has been partially reconstructed on an altered alignment two miles farther south as part of new highway construction work. Prior to construction of the floodway in 1962-68, its entrance was moved five miles upstream to protect St. Norbert, in keeping with the Manitoba Royal Commission recommendation of 1958. This change resulted in the La Salle River passing behind the West Dike rather than entering the Red River upstream of the West Dike of the Inlet Control Structure as intended in the original plan. 41. 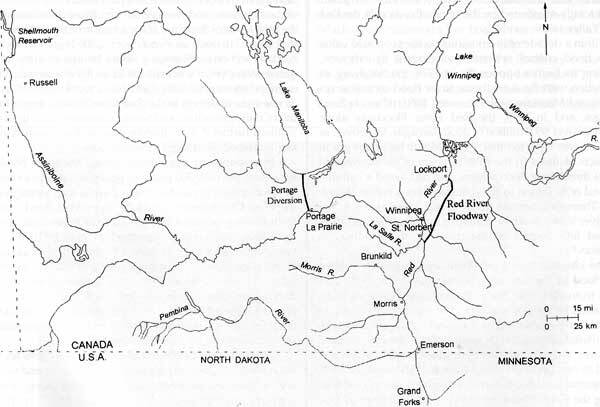 Red River Water Resources Council, “The 1997 Flood”, in Gene Krenz & Jay Leitch, A River Runs North, Managing an International River (Winnipeg: Red River Resources Council), 2nd. ed., 1998, addendum, p. A-4. At the Inlet Control Structure the 1997 flood would crest at 1.5 to 1.7 feet higher than the highest range forecast. 42. Manitoba Natural Resources, Water Resources Branch, “Facts and Figures”‘; and flood reports, Winnipeg Free Press, 27 April 1997, pp. A1-A3. The Red River Floodway system has a design-flood capacity of 140,000 cubic feet per second (floodway channel: 60, 000 cubic feet per second; river channel: 80,000 cubic feet per second). 43. Flood reports, Winnipeg Free Press, 25 April 1997, p. Al, and 3 May 1997, p. Al. There were 68 miles of primary dikes within the City of Winnipeg, some of which were raised temporarily, in 1997, with clay to the 28 feet level. However, other sections remained at the 26.5 feet level, as did many of the secondary dikes protecting homes along the river outside the primary diking system. The Perimeter Highway was constructed during the 1960s to a minimum road surface height of one foot above the 30.3 feet level of the 1950 Winnipeg Flood. 44. Bumsted, Floods of the Centuries, pp. 106-127; A Red Sea Rising, pp. 103- 104 & 166; Manitoba Natural Resources, “Facts and Figures”; and Globe & Mail, 15 May 1998, “Winnipeg Rescue Hurts Towns: Report”. Only two previous floods approximated the flow of the 1997 flood: the flood of 1852 (165,000 cubic feet per second); and the all-time record 1826 flood (225,000 cubic feet per second). In 1997 some 70 sewer outfalls were closed off; 35 sewage pumping stations were in operation; and many homeowners installed backflow valves and sewer plugs to prevent sewer backup into their homes. 45. Bumsted, Floods of the Centuries, pp. 117-119, & 132; Rannie, p. 213; and “Winnipeg Rescue Hurt Towns: Report”, Globe & Mail, 15 May 1998, Winnipeg Free Press, 29 April 1997, p. Al; and map of flood levels, A Red Sea Rising, pp. 96, & 123-124. The quote is from Manitoba, Natural Resources, “The Red River Floodway: The Story of One of Canada’s Biggest Excavation Projects” (pamphlet), Winnipeg, 1963. At Ste. Agathe the floodwaters breached the protective dykes from the west, or rear of the town away from the river. During the flood, City ol Winnipeg officials estimated the floodway was saving an estimated $1 billion in flood damage by diverting the floodwaters (Maclean’s Magazine, 5 May 1997, p. 32). Today, Manitoba Natural Resources estimates that the savings in flood damages in 1997 was close to $4 billion (E-mail, A. Skrepnek to R. W. Passfield, 10 February 2000). 46. “The Floods that Shape the City”, Sunday Free Press (Winnipeg), 16 March 1997. 47. Duff Roblin, Preface, Red Sea Rising, p. v.